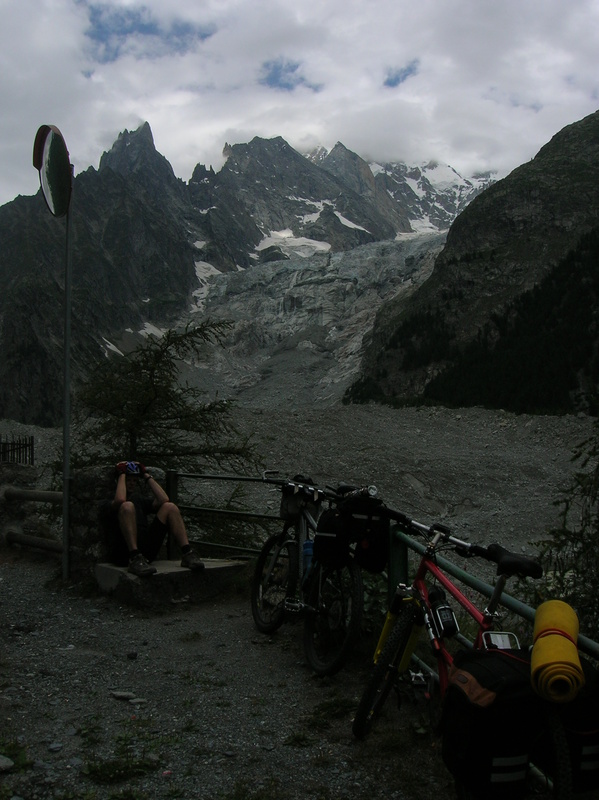 3-4 day bikepacking ride around Mont Blanc, off-road with some road. 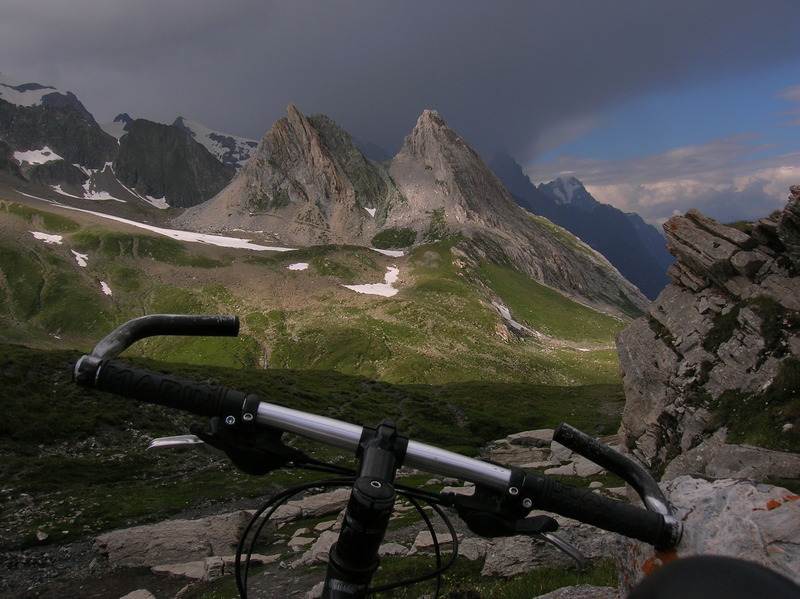 The TMB is a great bikepacking trip following an iconic trekking route around some of the most spectacular scenery in the Alps. It’s a route that takes you into the heart of the mountains and delivers massive rewards for the effort, both in terms of the scenery and the quality of riding. 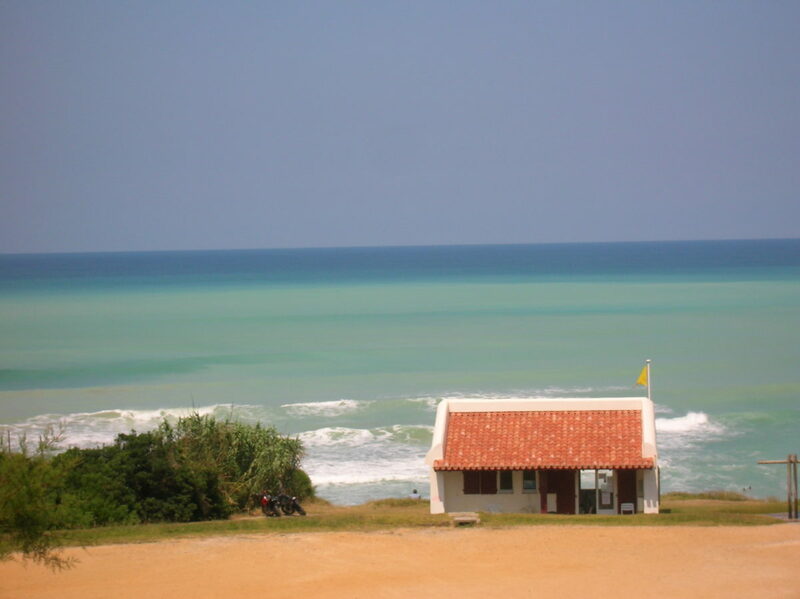 The TMB trekking route contains some sections that don’t work with a loaded bike so it’s more satisfying to use alternative routes to the trekking route at certain points. 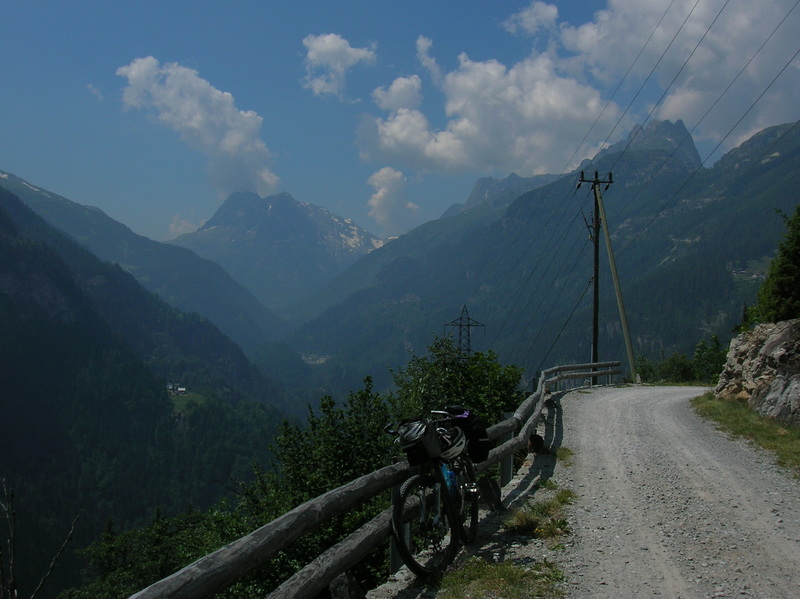 There is no standard mountain biking route for the TMB – and there are loads of variants so it’s worth spending a bit of time deciding what sort of trip you want. We did the TMB in three days – and decided to travel very light and carried just bivi gear, with no stove or cooking gear and relied on buying cooked food in the valleys. We started and finished in Martigny because of its ease of access from Geneva airport. We left our hire car in Martigny and set off late afternoon on the road to Orsieres and then on lanes up to Ferret. In total about 30k from Martigny. From here we picked up the trail, rode until dark and then bivied. The next day dawned warm and clear and gave us a tough but fantastic day as we traversed the two major cols of the route amidst stunning scenery. The first long climb, not all rideable, is to the Grand Col Ferret (2,537m) and then there’s a descent through Val Ferret into Italy to Entreves. 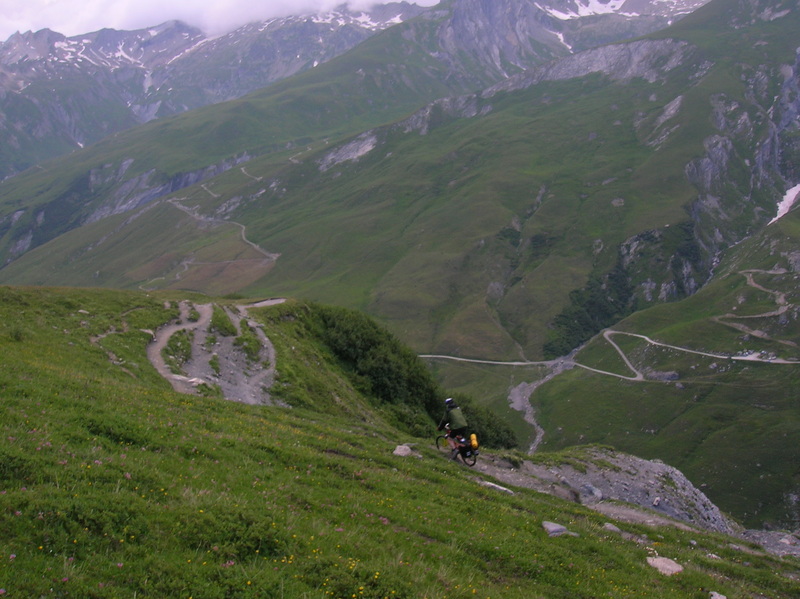 The climb up the long Val Veny just gets better and better as you’re close to the glaciers and peaks of the south side of Mont Blanc.The trail is rideable for most part and passes the Refuge Elisabetta before a final steeper climb (push!) 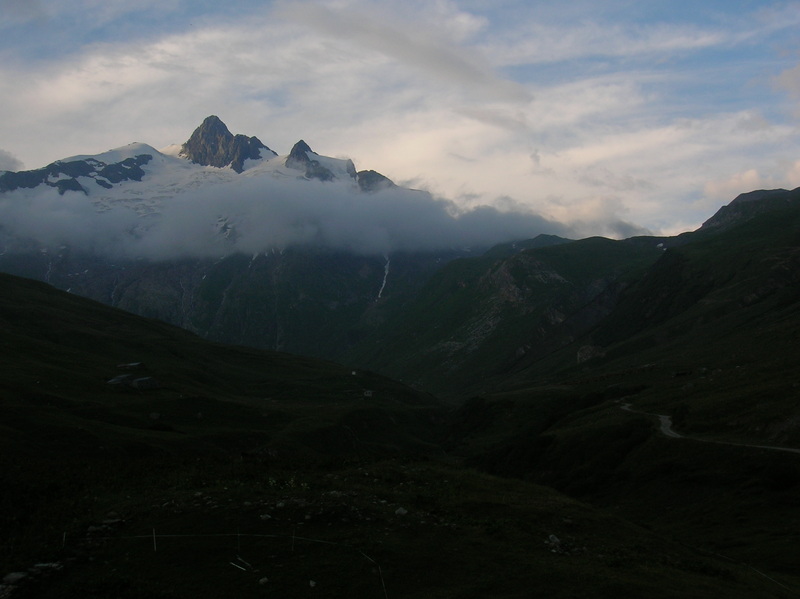 to the Col de la Seigne (2,516m). At the col you’re rewarded with spectacular views on the Mont Blanc range and now cross into the French part of the route. From the Col de la Seigne there’s perfect, sweeping and fairly straightforward single track then double track descend to Les Mottets. We stopped short of the village and bivied in a lush meadow with a stream and fine views of the surrounding mountains. 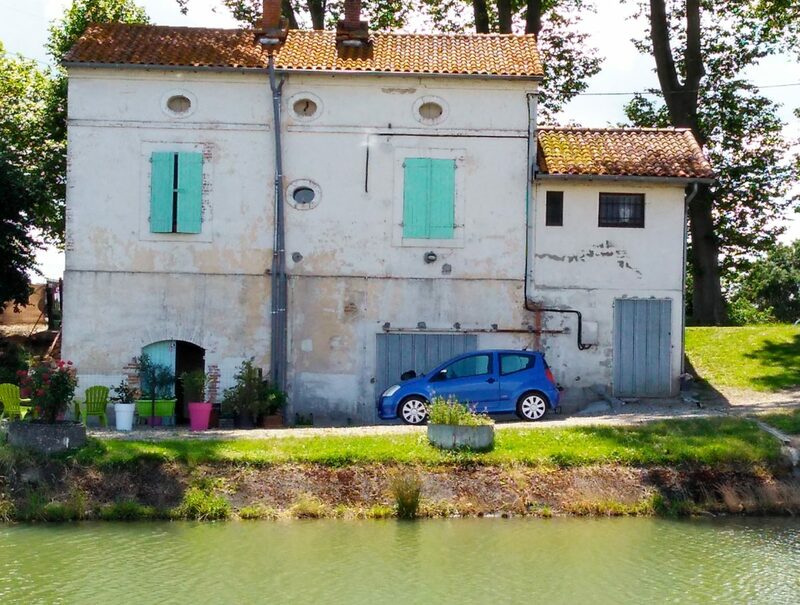 Excellent day – breakfast in Switzerland, lunch in Italy, dinner in France! Next day and another early start, and spurred on by the need for more food, we climbed steadily on the road to the Col de Roselend This col is popular with roadies and there was a steady stream of riders climbing up as we descended 1,200m on a virtually deserted road to Beaufort – a great, flat out descent. From Beaufort there is a choice of routes to the Col de Joly. 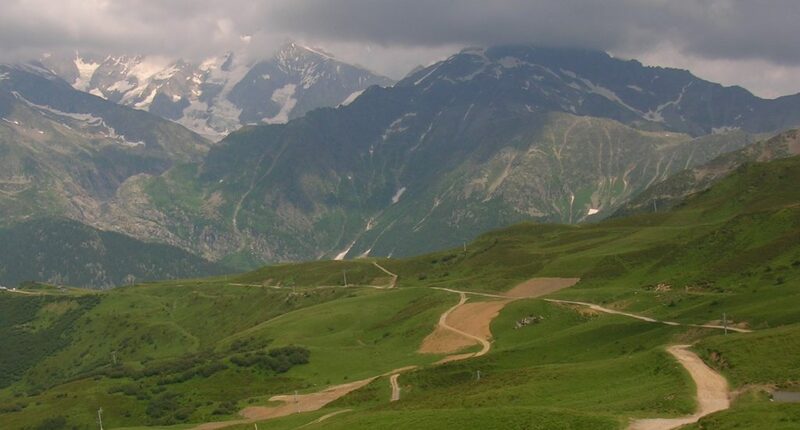 Either take the minor road via Hautluce to the Col de Joly or an alternative route taken by some of the guided trips is on a track via the Col de la Gittaz. 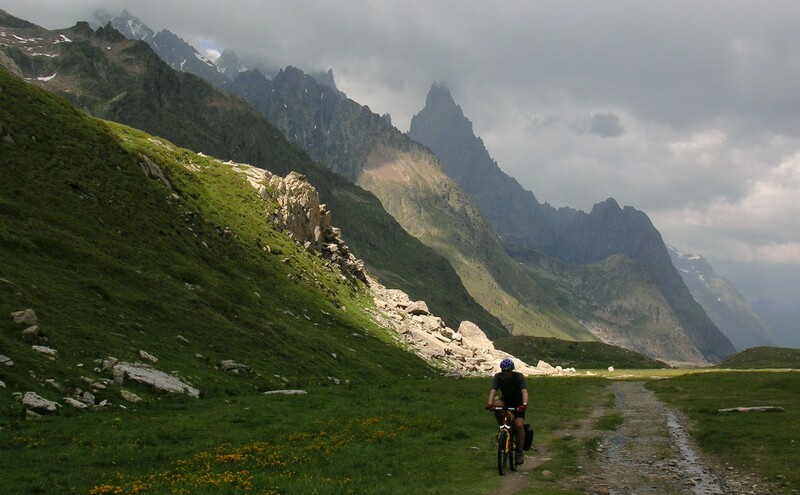 From the Col de Joly it’s an enjoyable run down long trails to Les Contamines. From Les Contamines there’s two choices of route to get back to the Chamonix valley. 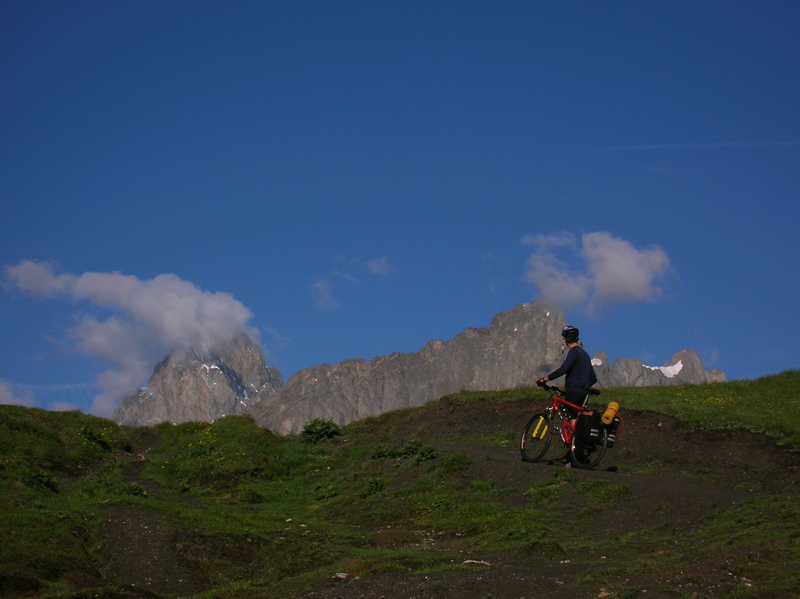 The most direct is to climb to the Col de Voza and then descend one of the MTB trails from the col to Les Houches in the Chamonix valley. The alternative is to take the road from Les Contamines to St Gervais and then continue on the road into the Chamonix valley and to Chamonix itself. 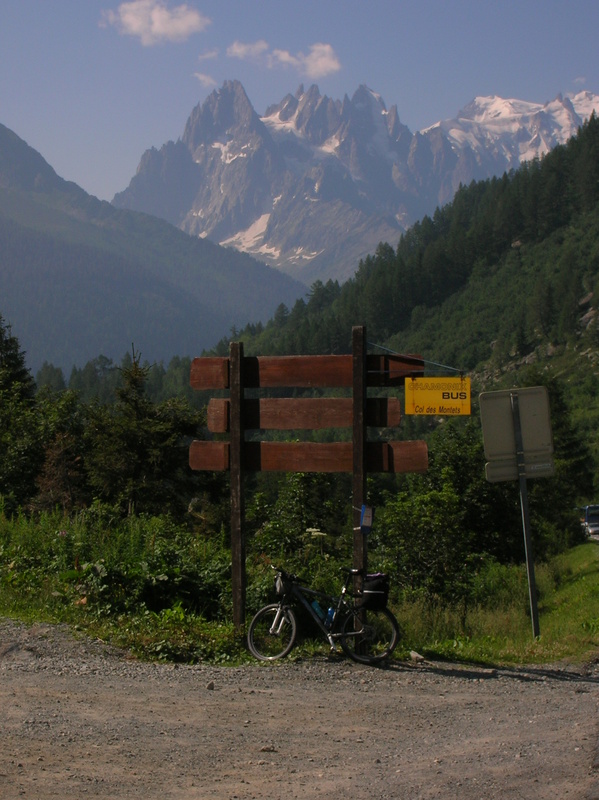 From Chamonix follow the road to 15km to Vallorcine with stunning views of all the peaks in the Mont Blanc range. At Vallorcine there’s a track that runs roughly parallel to the mountain railway that goes from Vallorcine to Martigny. 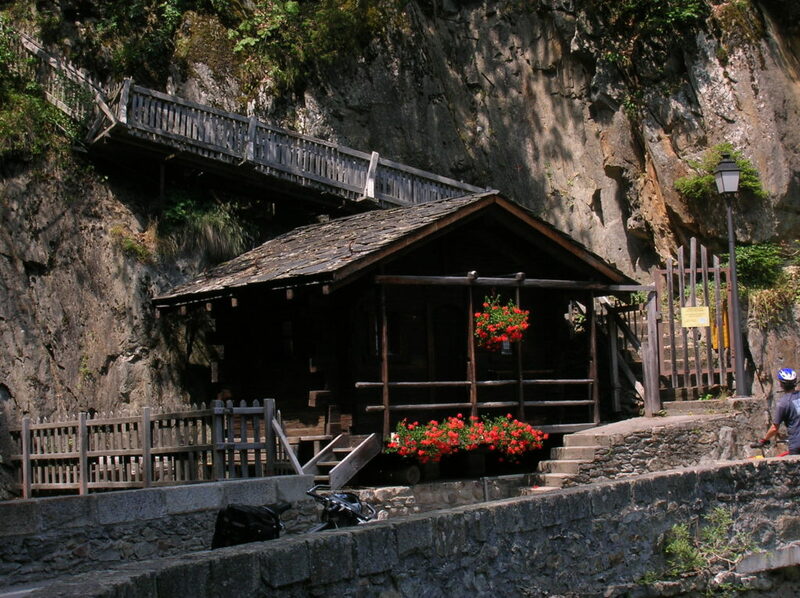 This track descends through woods passing some amazing houses built into the rock face of the gorge and criss-crosses the railway towards Finhaut, Salvan and finally to Vernayaz where you join the main road for a final few kilometres into Martigny. When you’re planning your route you might want to look at TMB route descriptions from some of the bike tour companies that opreate guided trips. The Chamonix and Mont Blanc area is very popular so there is a ready supply of food in the villages in the valleys and usually in the smaller mountain villages so it’s rarely necessary to carry more than a day’s food.